It was a dark, dark day when they shut down our Dairy Queen. It was the only one for probably 100 miles. All we were left with was the Pete's Dairy Cream across the street. It was not the same thing, with its soft serve that tasted mysteriously like those orange circus peanuts and mystery meat sandwiches they called "Jiffy Burgers." Eventually, that closed down as well and became a used car dealership with big fake palm trees out front. The old Dairy Queen became a printing place. You can't eat a wedding invitation on a hot summer afternoon, let me tell you. Well...you could, but it would taste terrible, even with a hot dog and a side of fries. I was probably despondent for days when DQ closed. I loved Dairy Queen. I still do. If I see one, I have to stop. Even if it's 4 AM and it's closed. "We'll just have to wait until it opens, won't we? I don't care if you are in labor." I've eaten two Blizzards in one day before. Heath Bar in the morning, Snickers in the afternoon. It was there. I wanted it. End of story. I see the majesty of that red shape in the distance. Narrow at both ends, wide in the middle. Like a big red eye, a distant winking siren. I begin to wonder if they make the mint M&M Blizzard there. Should I go in and see? Do they have Nerd Blizzards? If not, do the people who patronize this particular Dairy Queen know what they are missing? Should I have the Heath Blizzard with chocolate or vanilla ice cream? There aren't any Dairy Queens in New York. I heard tell that there might be a few out in New Jersey. Maybe I'll pack up and head out there one of these days. See if I can't find a little plot of land to call my own. Start up my own Dairy Queen. Live off the fatta the land. Have all the Blizzards I could ever want. Or something. It could happen. I had a Blizzard while I was visiting my parents this summer. It was divine. If you decide to make a pilgrimage to a NJ DQ, let me know, because I want in. On a semi-related note: yesterday I had a craving for some sort of Icee/Slurpee thing. Not a smoothie, mind you. Those contain too many natural ingredients. I couldn't find one near work, though. It was tragic. I'm very lucky that I work very near a 7-11. I'm very unlucky that I haven't had a Slurpee craving in the last several months. Until now. DAMN YOU! There is apparently one in Jersey City or something. msdirector lives in Jersey City. Let's visit her and find public transportation to DQ. Shall we? Visiting msdirector and DQ sounds like a wonderful plan! I owe you a dinner anyway. 3 words, 7 syllables: strawberry cheesequake blizzard. the end. does anyone remember "magic fountain" - that may have been a jersey thing, or maybe just a suburbia, new jersey thing - i don't really know. all i remember is it was the ice cream place of east hanover, then alluvsudden, boarded up, gone, and now it's a dunkin donuts?! HATE. i was 5 and it was magical ice cream and now i'm older and bitter that it's not around. @ayl: I was pissed a few years ago because they flaunted the monster cookie Blizzard in front of me, and then they didn't offer it everywhere. ASSHOLES! I'm afraid I missed Magic Fountain. 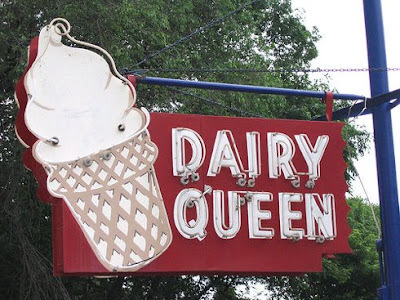 We had DQ, Dairy Cream, and the Dairy Inn, which we all called The Dirty Barn, for reasons you don't want to know about. When I go home to visit my parents, I go through the DQ drive thru, as we don't have one where I live, either. In high school, I spent many a night sitting in the DQ parking lot, eating peanut buster parfaits with my best friend-kinda boyfriend. Good times. I would kill for a German Chocolate Blizzard with chocolate ice cream right now. Do they even carry those anymore? This is how I felt when the 7-11 in my town closed in high school. The nearest 7-11 (and thus, the nearest place to acquire a coke slurpee) was three hours away. I did drive there twice, just for the slurpee. I mean, you're THIRSTY after a six-hour round trip. @sigourneyfever: That is ALWAYS my first stop when I visit my parents. Last time, I almost cried because when we got to town, it was closed, as it was 2 AM and all. @nadarine: People do not know what they're missing by not having a 7-11 nearby. I had a friend in college who worked at this gas station that had 20-some flavors of Slurpees. And he would get them for us for free. I loved him. shreya has this thing with the word DAIRY. it makes her shudder. but she has been to the DQ in new jersey so can attest that it exists. even if it's name horrifies her. the closest DQ to me growing up was 20 minutes away. instead, in town, we had the custard stand. which oddly enough, did not serve custard. but they did have awesome ice cream sundaes like the ET sundae. which was whatever ice cream or soft serve you wanted, hot fudge, hot peanut butter, and reeses pieces. it was not a restaurant. it was a huge stand. surrounded by picnic tables. and it had a GINORMOUS ice cream cone on top. vanilla. in a wafer cone. i prefer sugar cones. @jody! : I prefer the wafer cones. If it's soft serve. If it's hard pack ice cream, I like to eat it with a spoon. It all comes down to whether or not I get my hands dirty, which I hate.